You've stumbled into the midst of our fundraising season - For the next few months our family will be focused on raising money for Cystic Fibrosis research. This year's Tour de Tori will be winding its way across the Northwest walking, playing golf, eating pizza and drinking beer to help Tori and 30,000 other children and young adults beat this disease. Our main focus is the Seattle Great Strides walk, which will be held on Sunday, May 20th. Our team, Tori's Troopers, will be walking with over 1,000 other people to raise over $330,000 in one day for CF research! If you're a first-time visitor, start with the Great Strides, Tori's Troopers and Tori pages. You'll find background info, event details, and photos that we hope will convince you to donate to the cause, participate in a CF event and help spread the word. Thanks for your support! 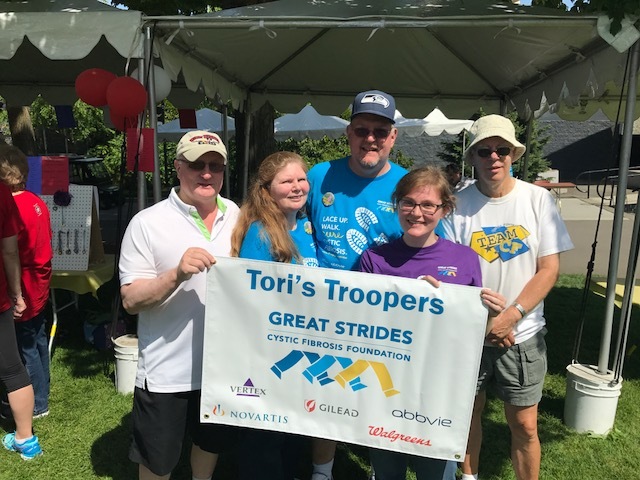 Come join Tori's Troopers on Sunday, May 20th, at the Seattle Great Strides walk! While we’d prefer donations by Friday, we accept donations year-round, so it’s never too late! To register for the walk or to donate on-line, go to our team page at http://fightcf.cff.org/goto/toristroopers. Thanks for your support!